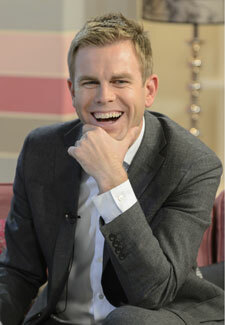 Daybreak anchor Matt Barbet, 36, is married to Katie and they have two daughters, Blythe, one, and Manon, three. Here, he tells Woman’s Own about his love for Liverpool and coffee and reveals his man crush. How do you switch from talking about a hard news story to discussing something lighter on Daybreak? It’s called a gear change. It comes from practice and knowing when to put in a pause or a look to your co-presenter. How much does the show change when you’re on air? It’s very hectic. We try and cram in a lot and make it as pacey as possible. We aren’t going to hold the audience’s attention for a 10-minute interview when they’re trying to get their kids to brush their teeth. We set up a lot of stuff the afternoon before the show goes out the following morning. I check the online news sites just before I go to bed at 9pm and I check them again first thing when I wake up. I get into the office at about 4am. I’ll talk to our team of researchers and my co-host Ranvir Singh about the running order. We don’t just show up, read the words and leave. We’re more involved than most people realise. It’s a team effort. It’s true! She wears stunning shoes. I can confirm that her heels could kill. I wouldn’t want to get on the wrong side of them. What’s your choice of breakfast before Daybreak? I’m a coffee nerd and I like really good, really strong coffee. The stronger the better. Ranvir and I can’t get by without coffee. My wife makes me dabble in herbal tea but it doesn’t hit the spot. For food, I try and alternate between eating something bad like a bacon bap and something healthy like porridge. How hard is it to be a dad when you’re working odd hours? Well, my children have both recently had chicken pox so I’ve been scooting off from work as early as possible to look after them. Judging by your Twitter feed, it seems you have three loves in your life: news, cycling and Liverpool Football Club. Is that accurate? I think you’ve hit the nail on the head. I should add that those things all come behind my wife and children! Tell us about your passion for bikes. I’m 36, so I’m not quite a middle-aged man in Lycra, but I am one of those blokes who has hit a certain age and fallen in love with cycling. I’m properly serious about it. I get out there on my bike even it’s wet and grey. It’s not just the cycling, it’s buying all the cool kit too. Damian Lewis has a daughter called Manon, like you, doesn’t he? Yeah, he has. Honestly, me and Damian Lewis should be mates. He loves cycling, he’s got a daughter called Manon and he supports Liverpool. We’re meant to be best pals! Daybreak is on ITV1 weekdays from 6am. To read more about Matt’s co-host Ranvir, click here.